Writing Prompt: Choose a favorite photo. Describe the scene/person/story behind it. We hopped off the pick-up truck, releasing our fingers from the iron bars that had been caging us in and letting our mary janes thump as they hit the dusty ground. The jungle around us throbbed with the ceaseless pulse of lurking wildlife–insects that only stung in the heat, birds that warbled, hidden and hungry, in the tops of the trees. There was only the highway, stretching its way into opposite directions like a just-woken napping child, and the jungle. My companion and I knew no one, and no one seemed to present themselves as far as the eye could see. We started walking, determined, books swinging in our hands and backpacks heavy on our shoulders. A row of makeshift dwellings started piping out on the right hand side of the highway, only visible by the rows of clothesline and garments fluttering out in front of each. 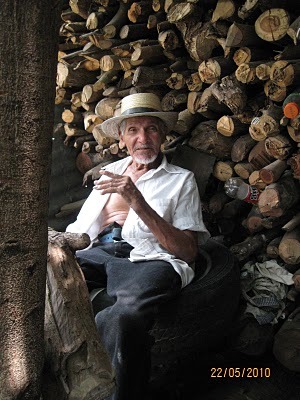 After knocking at two doors and only finding rejections or excuses, my eyes caught sight of a man up ahead, his thin back leaning against a stack of logs, his bottom resting on an old tire. His house was smaller than the tree providing him shade, smaller even than the logs providing his chairback. Marching our way through the grasses overgrowing the area in front of his home, we stopped when we were within comfortable speaking distance. His stiff, wood-like fingers were clenching a cheap ballpoint pen, which scratched meticulous notes in the juvenile notebook resting on his lap. 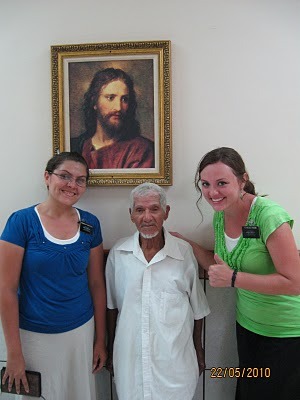 After introducing ourselves, he didn’t even glance up, but simply said, “I’ve never been baptized by a Mormon before.” He invited us to grab a bucket and a stool with plastic cords for a seat and sit down and chat with him. I asked him what he was writing. “My life story,” he replied, still intent on his letters. “I’ve lived 100 years, and I’ve never forgotten anything from the time I was 4 years old.” Sure enough, his notebook (and the ones like it stuffed in his mattress) contained lists hundreds of pages long of dates and events, names and deaths, some recent, some 96 years back: tales of abuse and betrayal, of triumph and toil, of family and faith. His name was Francisco. He survived off of the bean plants in front of his wood pile, the mangos he found on the ground, and the occasional glass of fresh-squeezed lemonade and bowl of tortillas that his ex-partner, who lived next door, brought him. Thirty years they’d been together, had a son together. Until one day when his son kicked him out, and he went to live in a room hollowed out from the small hill that the house rested on. Francisco claimed that Noah sailed around the world in his ark sometime in the 1400s–he showed me lists of equations meant to prove that fact. He was the only man above 70 within miles who could read and write, and he took great pleasure in reading aloud passages of scripture and quoting his own ideas of the devil and hell. He sang us hymns he’d made up himself–snippets of songs he’d heard in his dreams and had written down first thing in the mornings. The day of his baptism, we made him eggs, cheese, cream and beans–his first real meal in perhaps years. His eyes glowed as he came out of the water, as he steadily walked the three miles to the churchhouse every Sunday. We visited him almost every day, especially when his body grew even more spindly and his eyes seemed to see other dimensions that ours couldn’t. It seemed like every hour should have been his last. But there he was still on my last day in the jungle, turning down the corners of the manual we’d given him and muttering the words to himself. I almost cried as we said goodbye, his hand patting mine. I left him an orange soda and the photo below, knowing we would never meet again in this life. This is my tribute to you Francisco—your diligence in recording your own life inspires me still.